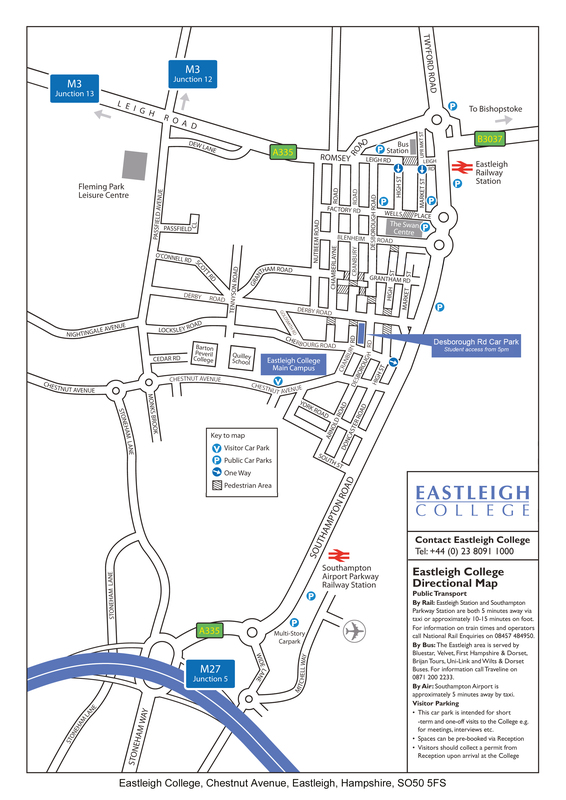 Eastleigh College can be easily accessed via a range of transport methods, including a range of public transport. A directional map which details the College's location, is also available. You can also view directions from local schools here. On-Site car parking is available to current Eastleigh College students after 4pm each day, at both the Main Campus and Desborough Campus, on a first come, first served basis. Free on-site bicycle and motorcycle parking is available throughout the day/evening to current Eastleigh College students, on a first come, first served basis. The Eastleigh area is served by Bluestar, Velvet, First Hampshire and Dorset, Brijan Tours and Xelabus buses. For more information, please refer to our travel plan, or call the local travel line on 0871 200 2233. Alternativly, bus routes are also available on Google Maps by selecting 'directions' and then the 'bus' icon (located between the 'car' and 'walking' icons). Eastleigh Station and Southampton Parkway Station are both within a 5 minute taxi ride, or 10-15 minutes on foot. For more information on train times and operators please call National Rail Enquiries on 08457 484950. Southampton Airport is approximately 5 minutes away, by taxi. For further information about getting to and from Eastleigh, please visit the Eastleigh Borough Council website, offering advice on Car Parking, Public Transport and Highway Maintenance.